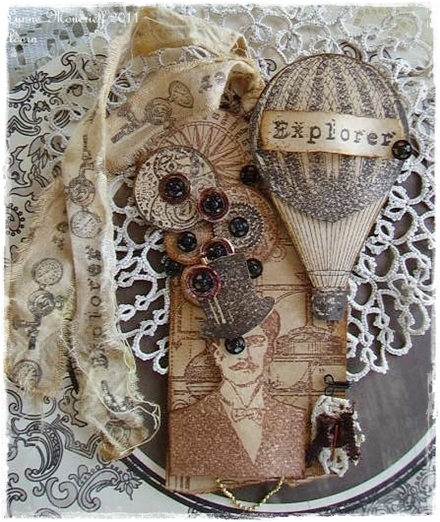 For my Guest Designer sample I was inspired by the digi stamps I received to play with. 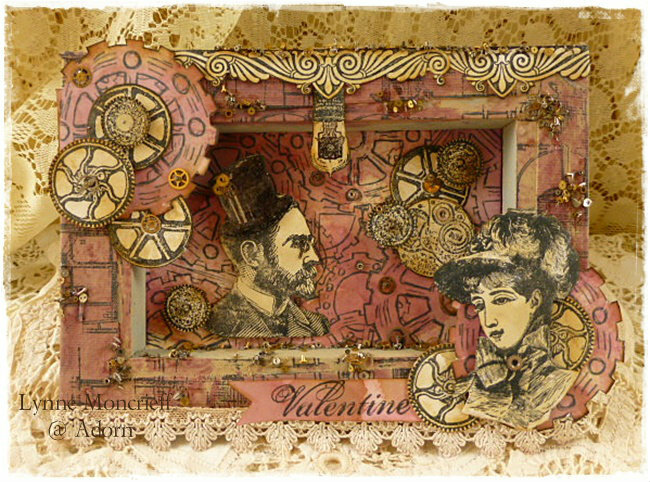 Knowing I was going to work on a flipped over canvas I re-sized the cogs and wheels digi background stamp, printing onto paper I had stained a pink/plum colour in keeping with the theme of love. Printing out the cogs and wheels background digi stamp, re-sizing to the required size was a time saver in comparison to actually stamping this size of background. However I also incorporated stamping, reaching for various Oxford Impressions stamp sets starting with stamping, in a random fashion, a large blueprint stamp onto the frame of the canvas, it worked well with the digi stamps. 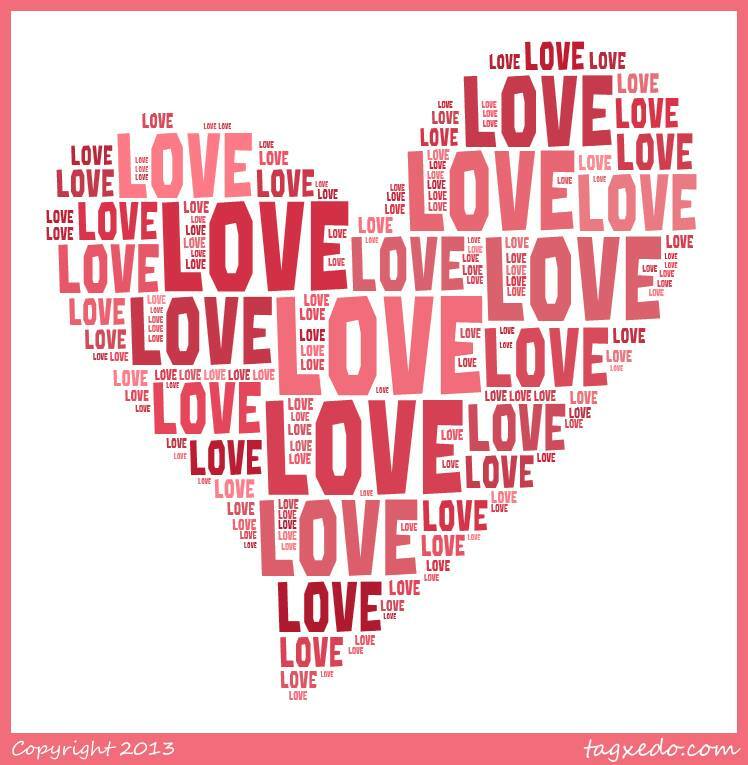 I had to remember that although I was given steampunk digi stamps to play with, the theme for the challenge is Love. One of my love of stamps is that we can create stories around them. Do we see her as the woman who has her eye on the dashing inventor or is he the one beguiled by this forward thinking woman who conjures up new inventions or possibly they are equals in this Steamy Affair. 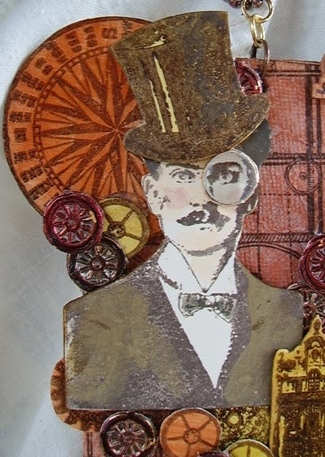 This photograph shows the detail of the background digi stamp with the other elements all stamped onto stained cardstock which I have added watch parts to, including his top hat. 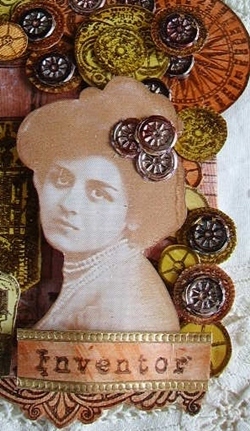 The pink/plum element which the woman is layered onto, that is another digi stamp. This is an individual digi stamp which I treated in the same manner as the background, re-sizing the image before printing onto stained papers. 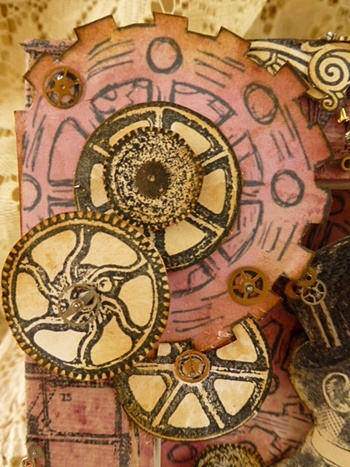 Once cut out I layered stamped cogs. It shows up on the other edge of the canvas. I would like to thank That Craft Place for allowing me to have some fun as their Guest Designer for their Love challenge. Sunday rolls around once more and so time for my DT post for That’s Crafty. 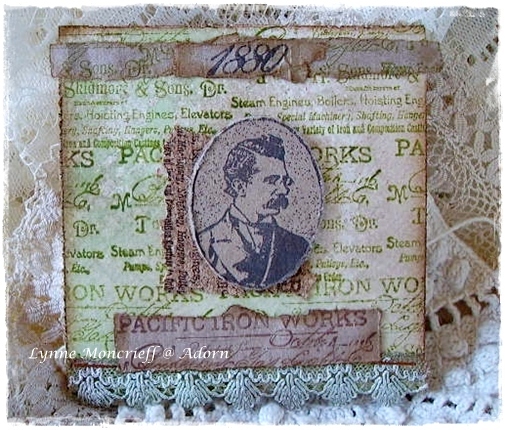 Moving away from Christmas themed artwork, this week it is a masculine themed sample I share at the That’s Crafty Blog. It was tricky selecting the sneaky peek portion of this sample as there is so much taking place but this gives you a flavour of the project. The project with instructions can be viewed at the That’s Crafty Blog. Thank you for your visit today and this past week. I am in the middle of trying to organise my files of artwork stored on my laptop as I have that sense, any time soon my Blog will be consumed with Halloween and Christmas projects so I really do need to organise older items and slot them in now and this post certainly does contain older items. The two pieces of Oxford Impressions artwork, a wall hanging and tag were actually submitted to Rubber Stamp Madness on my behalf, which was a lovely surprise in itself but then to have the Editor contact me to say that they wanted to feature the two pieces in the form of an article, well you can imagine how excited I was at such a prospect especially as this was the first time my art had been submitted to RSM. 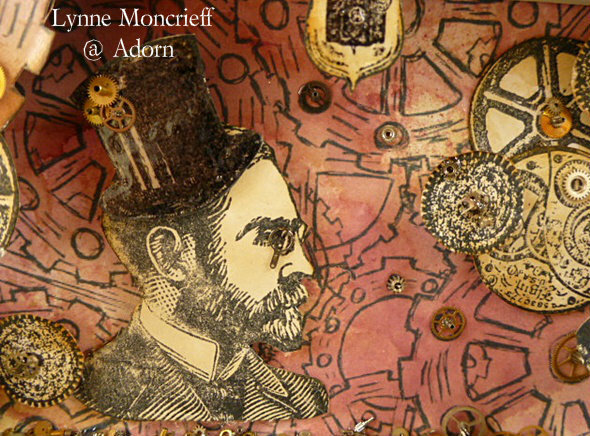 It was all very interesting as I was asked questions such as what inspired me to create the two pieces, my creative process and asking whether Steampunk was popular in the U.K. those were just some of the questions along with having to provide step-by-step instructions. The stamp credits are Oxford Impressions:- Steampunk Elements and the photo real stamp of the lady is from April In Paris. Both sets available directly from Oxford Impressions but you will also be able to purchase them, in the U.K. from That’s Crafty. Normally I would provide some details as to the process of creating the artwork but you will appreciate that it is unfair to RSM if I were to do so. However I will say that this involved lots of fussy cutting and I do mean lots as all those cogs, wheels, etc were hand-cut. 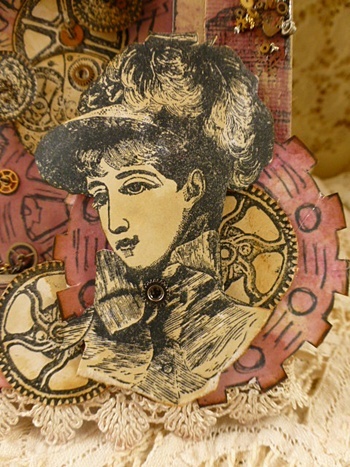 The notion behind this Steampunk inspired wall hanging was to have the woman as the inventor. However, she is very smitten with the dashing London gent who walks into her life. A border of stamped elements runs across the bottom edge. The second item in the article is this tag which again involved lots of fussy cutting! Many thanks for visiting this post. So far I have not mangaged any visits to your Blogs but I hope you are all having a good start to this week and I do plan on catching-up with you soon. Recently I shared art which was published in Stampington & co’s 400 More Ideas. This post contains another card which was also in the same publication, a card using some stamps from Oxford Impressions’ fabulous London Telegraph set (also available from That’s Crafty). Unusually for me, this card is only 4″x4″ in dimension. The base consisted of watercolour paper which had previously been prepared with homemade spray, the colour I would say was lettuce, which hasn’t shown up well in this washed out photograph. 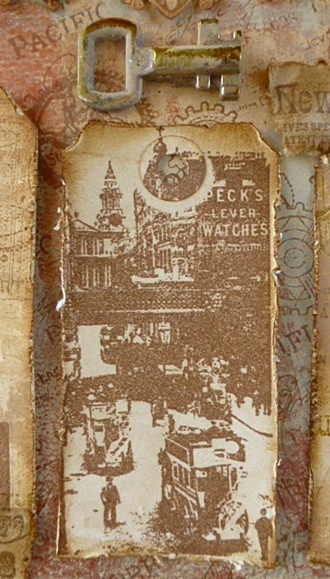 I then overstamped a text stamp before layering up stamped elements which were stamped onto various surfaces which provided a nice mix of textures. 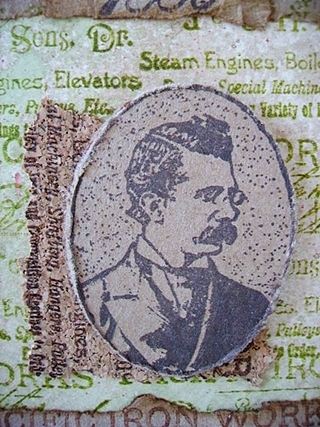 The gent was stamped onto kraft style paper (re-cycled cardboard) and some text stamped onto cork fragment. I remember I also stamped onto parchment paper to give extra texture to the card. I will be absent from Blogland for a few days (keeping my fingers crossed it will not be any longer than that) due to health matters. On my return I will enjoy catching up with your Blogs. My post for That’s Crafty, on Sunday, is scheduled and if all goes well I might be able to schedule another post between now and then. I haven’t forgotten about the promised Giveaway. At the time of writing I am unsure if it will be posted this week or next but if you like stamping then keep a look out! Thank you as always for your visit. 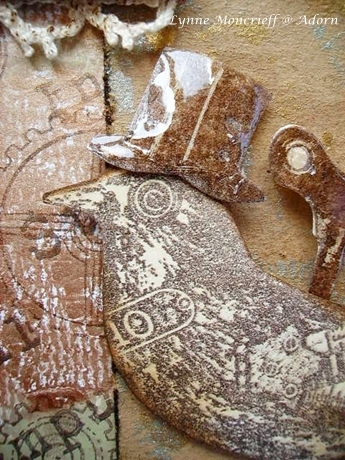 My DT project for That’s Crafty saw me playing with a Gelli plate for the first time. 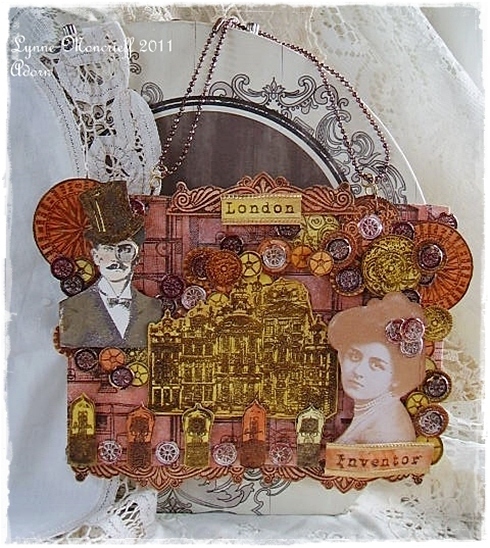 Now I am not a Gadget Queen but the Gelli plate has been in my mind as it always looked such fun. There is no doubt that I am in awe of crafters who use colour, not shying away from it but embracing all the colours of the rainbow however I am not such a soul and was unsure if was the right fit for me. For my project you will see me make use of my second print (the first I’ve saved for a feminine project) but from the get go I was hooked, this could possibly become addictive! Of course all I will share with you here is the merest peek at my project. A full view with instructions and supply list can be seen HERE at the That’s Crafty Blog. Apologies to any of you who are signed up to receive new posts. Yesterday I was organising new pages as my sidebar was becoming a bit overloaded and a tidy up has been long overdue, however I had no idea any of this would go out as a new post. Anyway, I still have some more to add so apologies in advance of any other such notifications you receive. Many thanks for visiting this post. Time once again for my weekly DT project for That’s Crafty. Fun was had as I played with something that was new for me, something I had been wanting to try for some time now. 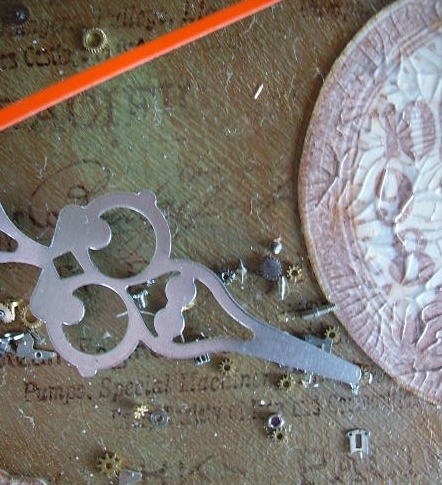 Let me share with you what I had fun with This is a Speedball Stamp Carving Kit. What did I create with this kit? 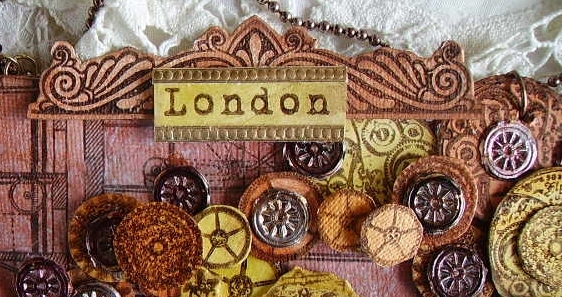 Well you need to take a peek at the That’s Crafty Blog. Enjoy your Sunday and many thanks for visiting. Sunday marks another DT post for That’s Crafty. The little sneaky peek is this …. I’d say from this peek that you have a good idea what the project is! To view in full along with supply list and instructions then please visit HERE. I don’t know if I’ve mentioned before but if you are interested in keeping up-to-date with new stock at That’s Crafty then you can sign up for the newsletter, just visit That’s Crafty on-line store to sign up.